When is it recommendable to undergo surgery? What if you wait too long before undergoing surgery? Is an MRT (magnetic resonance tomography) required prior to surgery? What exactly happens during surgery? Where does the incision go for this type of surgery? Is this an outpatient procedure or will hospitalization be required? the patient does not respond well to any conservative treatment because he/she disposes of three relevant tendons (as opposed to two). This relatively frequent anatomic phenomenon may persist without providing any symptoms for years or even decades. There is no concern as the De Quervain´s syndrome represents a benign non-infectious inflammation of the tendon sheath. So before deciding “pro and con” surgery a patient has all the time to try out the appropriate conservative therapy approaches first, prior to opt for surgery. This also includes alternative therapy approaches like e.g. the low level laser therapy on tendon sheath inflammations. 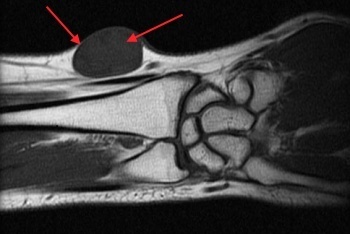 Tumor at the radial wrist, simulating a tenosynovitis. No. This is only required in isolated cases. The image shows such a case. There is a tumor located within the operating site. If in the neighboring tissue there are other conditions such as carpometacarpal osteoarthritis or similar degenerative alterations it may be necessary to perform an ultrasound exam or take an x-ray image. The first extensor compartment has to be split. In advanced cases the resection of inflamed tendon sheath tissue may be required as well as the release of tendon adhesions. During surgery the incision will be placed right between the two arrows seen here. 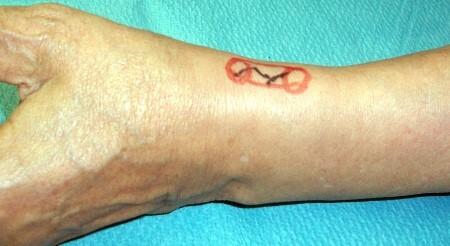 An angular incision (black line) is placed above the first extensor compartment (image) in preparation of surgery. Alternatively a transversal incision may be selected! Next, the fatty layer is positioned aside in order to expose the constricted, deep-laying first extensor compartment. Once that happened, the first extensor compartment is fully divided. The now broader tendon canal will let the extensor tendons of the thumb slide unhindered. The surgical effort is finalized after hemostasis by skin sutures and dressing of the wound. Some surgeons also apply a cast splint to stay on during the first days after surgery, as it will help reduce the pain. Usually the procedure will be performed as outpatient procedure unless the patient suffers of other critical general conditions or if he/she cannot secure proper care while being at home. In these cases hospitalization may be the better option.